In Southern California, there’s a food phenomenon known as the rolled taco. For whatever reason, “rolled tacos” are exclusive to SoCal. Sure, we see “taquitos” and “flautas” on menus all over, but really, they’re not the same (even if technically they are). Could be in the way they’re prepared–tightly rolled corn tortillas filled with beef or chicken, fried to perfection. More likely it’s in the way they are served–three in a small paper food tray, topped with guacamole and shredded cheese. In any event, when I found out Heather over at girlichef and Bea from The Not So Cheesy Kitchen were co-hosting this week’s Global Street Foods for #SundaySupper, the first thing that came to mind were these rolled tacos. Now, you’re probably wondering what would a born and raised San Franciscan know about rolled tacos? Well, my quest began at a young age, when my BFF, who was raised in San Diego, would go on and on about these “rolled tacos.”Â Eventually, I moved to Del Mar for a few months, spent most of my time in San Diego, and every day was a hunt to find the next rolled taco. Mind you, I wasn’t there just for the tacos, although some days it seemed that way! Even though Los Angeles likes to lay claim to this delicious treat, the best are in San Diego. And they’re everywhere–just about every restaurant, bar, hole in the wall, and taco truck sells them. One place I visited even had a whole salad bar dedicated to toppings, but purists know, they’re simply served with guacamole and some shredded cheddar cheese on top. This particular recipe makes great use of leftover chicken. I simply picked up a rotisserie chicken from the local market–although I could have easily roasted a couple of chicken breasts to make the dish. If you’d rather have beef, try this melt-in-your-mouth slow cooker beef barbacoa from the Unsophisticook. Since we try to avoid fried foods as much as possible, I baked these instead of frying, and the end result was just as satisfying, without the extra guilt. Try serving them with Martin’s Easy Mexican Rice for a complete meal. 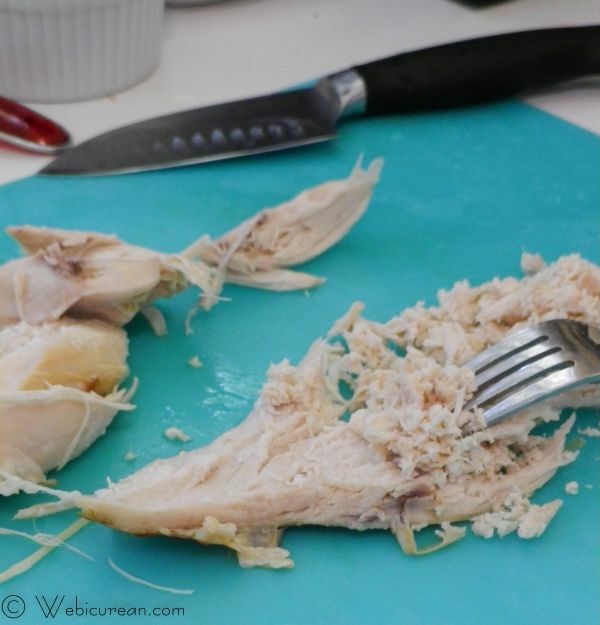 Shred the chicken with a fork until you have 3 cups’ worth. 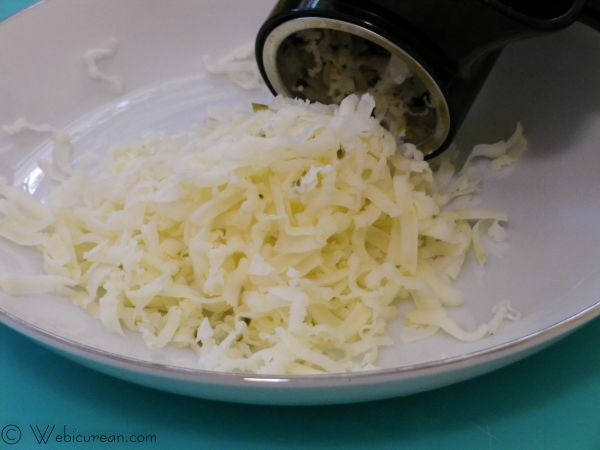 In a large bowl, thoroughly mix the chicken with the cheese, crushed garlic, and salsa.Â Set this aside. Heat the tortillas in the microwave–place on a microwave-safe dish, cover with a damp paper towel, and zap for about 30 seconds.Â This will make them more pliable so they won’t crack. 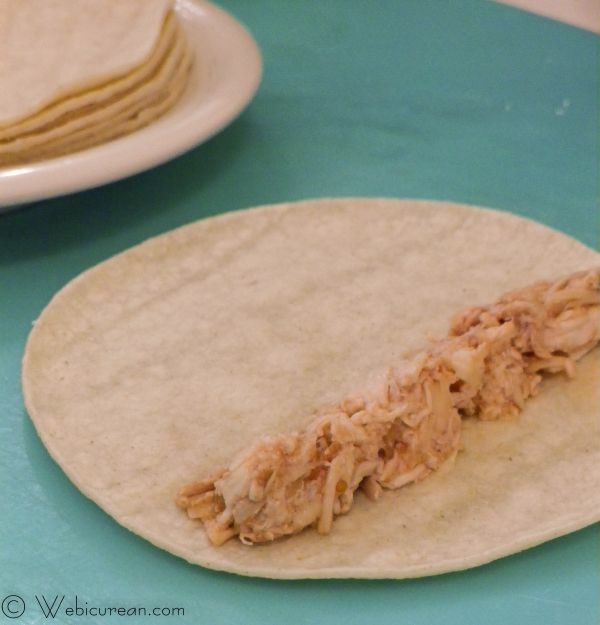 Spread about 2 tablespoons of the chicken mixture across the tortilla, and roll it up tightly. 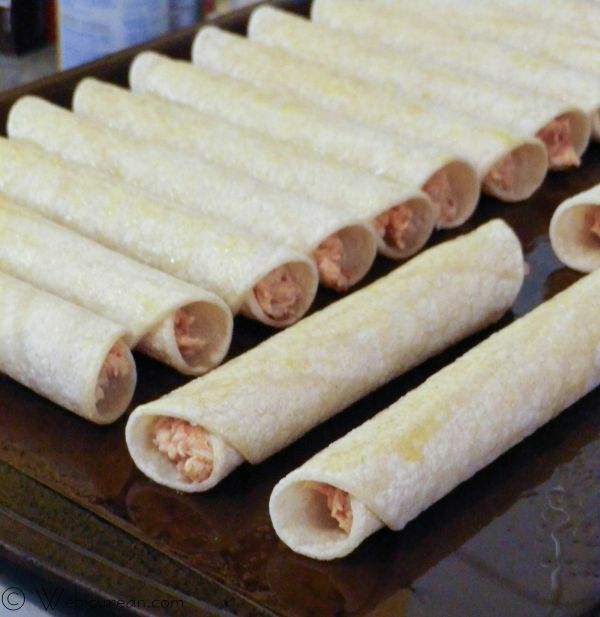 Line up the rolled tacos on a greased baking sheet. If necessary, secure with toothpicks. Once you’re done, brush lightly with a little olive oil, then pop them in the oven. While the taquitos (!) 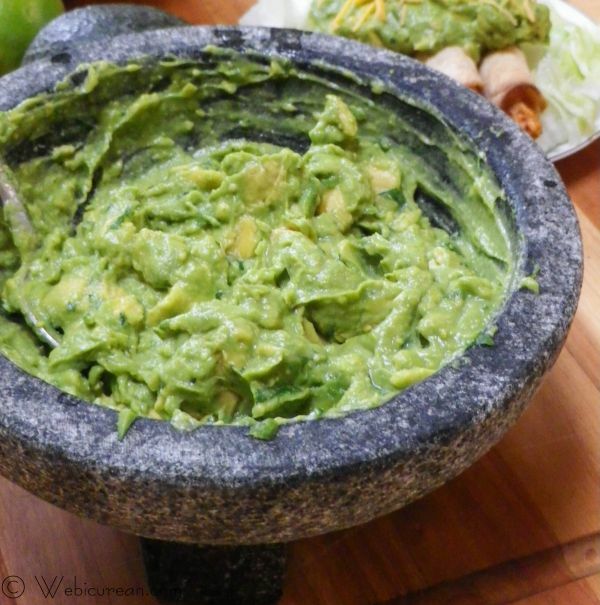 are baking, make the guacamole in a molcajete if you have one. First crush the onion, garlic, and jalapeno in the bowl. Next grind in the cilantro, then mash the avocados in one at a time, until the desired consistency is reached. Stir in the lime juice and salt to taste. By the way, to store any leftover guacamole, try this tip for covering it with water. Meanwhile, the tacos should be done, so remove from the oven and let cool a bit. 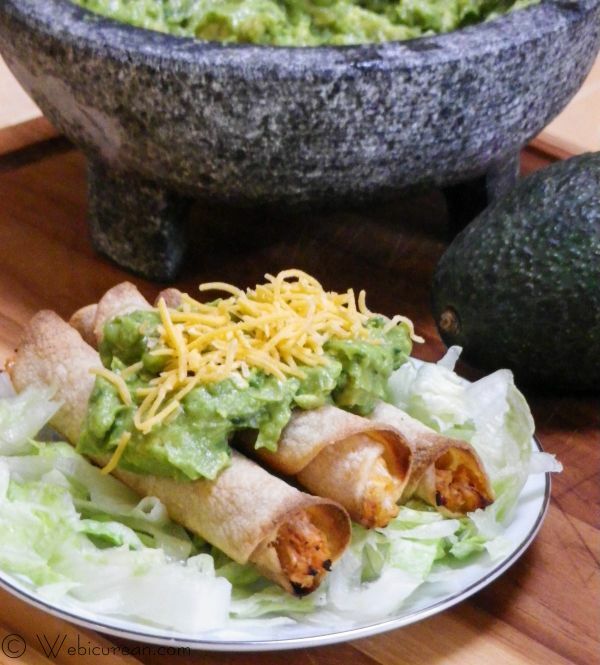 These taquitos, or rolled tacos, are filled with a savory blend of chicken and pepper jack, then topped with guacamole for a Southern California treat. 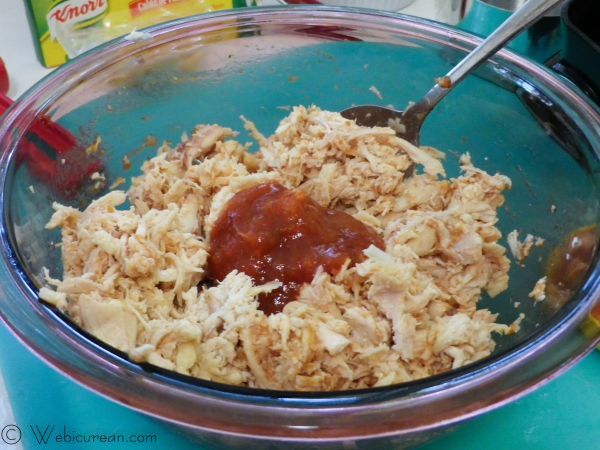 In a large bowl, mix together the chicken, garlic, cheese, and salsa. Set aside. Warm a stack of tortillas covered in with a damp paper towel in the microwave for about 30 seconds. The tortillas need to be hot enough to be pliable but not too hot to the touch. Spread about 2 tablespoons of the chicken mixture straight across the tortilla (as pictured above), then tightly roll up the tortilla. Please seam side down on a greased baking sheet. If necessary, secure with a toothpick. Lightly brush a little olive oil over the top of each rolled taco, and bake 15-20 minutes, or until they start to brown. Serve hot topped with plenty of guacamole and shredded cheddar. This creamy guacamole is seasoned with onions, garlic, cilantro, jalapeno and a splash of lime. 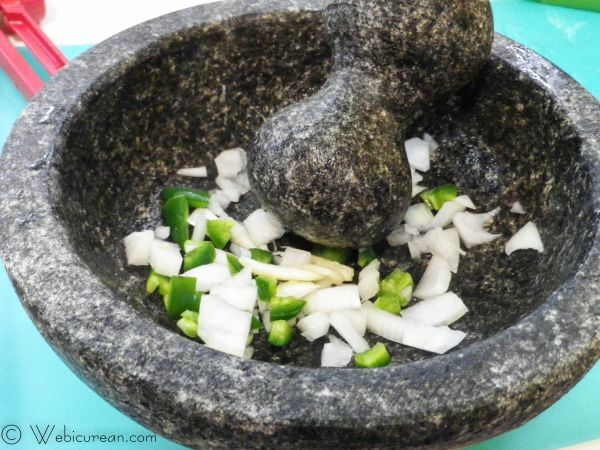 Finely mash the jalapeno, onion, garlic, and cilantro in a molcajete. Next add the avocados, one at a time, mashing to the desired consistency. Avocados have been small lately, so use 2-3 depending on the size. Stir in lime juice and salt to taste. Now let’s see all the street foods the rest of the #SundaySupper crew has cooked up! So tell me, what are your favorite (GLOBAL) STREET FOODS? Â Do you seek out food trucks, carts, and vendors? Feel free to leave me any links or stories that you may have about Street Food experiences in the comments section. 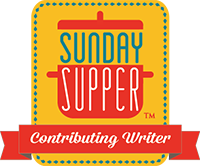 Â Also, please join us for our live twitter chat tonight at 7pm (Eastern) using the #SundaySupper hashtag, and check out the Sunday Supper board on Pinterest. Note: I earn a modest commission on any purchases made via the amazon.com links on this page. 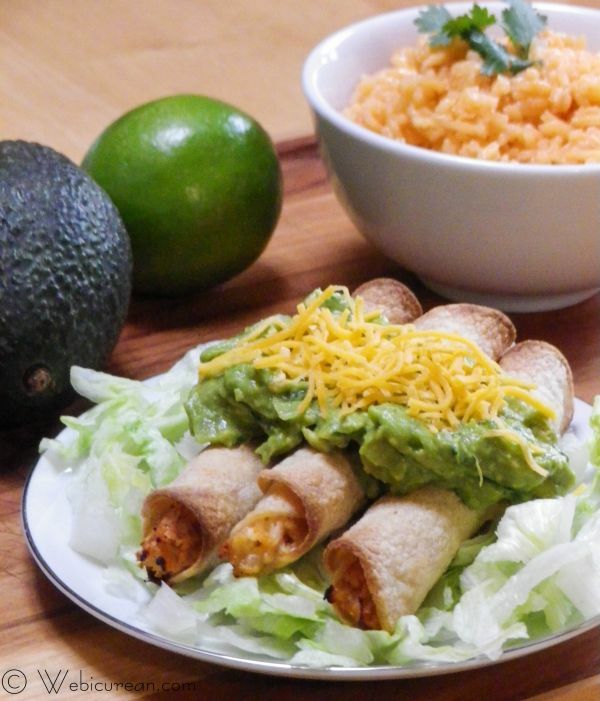 LOVE this rolled taco and the fact you baked it! Now I want to bake my tacos…too cool. Thank you for sharing! I could eat a million of these! Jen @JuanitasCocina recently posted..Tortas de Milanesa (Pork Cutlet Sandwiches) ~ Global Street Food #SundaySupper! Want for breakfast right now! Oh, my, do these look terrific! That guac and cheese topping is PERFECT!!! 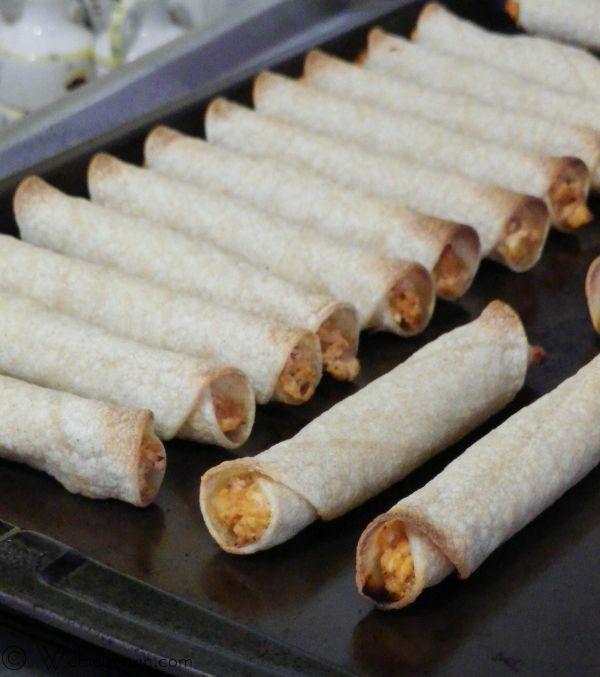 In Texas we always called these taquitos or flautas, but seeing your pics, I am suddenly not caring what the heck they’re called – now I’m just craving them something fierce! I love that you baked them, too. Yummy!! Apparently, you haven’t had street food in CA if you haven’t eaten rolled tacos. They look sooo good, I don’t think three is enough! Hehehe I am a San Diego girl. I made beef and you made chicken. I think we are a match made in heaven!!! Love these, they made me drool! I will have mine with extra guacamole please, these look divine!! Its so funny because I live in San Diego and I haven’t eating this yet. Love, love Mexican food but I must confess I’ve never had a rolled taco. Surprised they haven’t made their way to NorCal. They look great! I’ll actually be in the San Diego area for a wedding this fall, so I will NEED to find some of these 🙂 Can’t wait to try them!! You shouldn’t have any trouble finding some–they were literally everywhere last time I went! Yum! I love taquitos/flautas/rolled tacos especially chicken ones and to add pepper Jack cheese makes them even better. Yummy! We’ve tried these before, but the corn tortillas always end up cracking, and we end up with a tasty pile of mess. Yours look so beautiful! Well, you know, a couple of them did crack, but not to the point where the filling spilled out. It’s all in cooking the tortillas first–one technique I saw was to dip the tortillas in simmering broth. Sounded too messy for me, but you could try to see whether that helps! YUM! I know what I am making for dinner tonight!!! It’s always a good idea to serve hearty fare with all those cocktails! Seriously wishing there were food trucks here in Atlanta where I could get these rolled tacos. Oh well. At least I have your recipe to make them at home. Love that they are simply topped with guacamole and cheese. LIES!!! We in LA do not even try to claim the rolled taco. I am from East Los and we have no idea what a rolled taco is. We eat the hell out them on the way back from TJ. Along with another mystery … the California Burrito. Que rico!!! 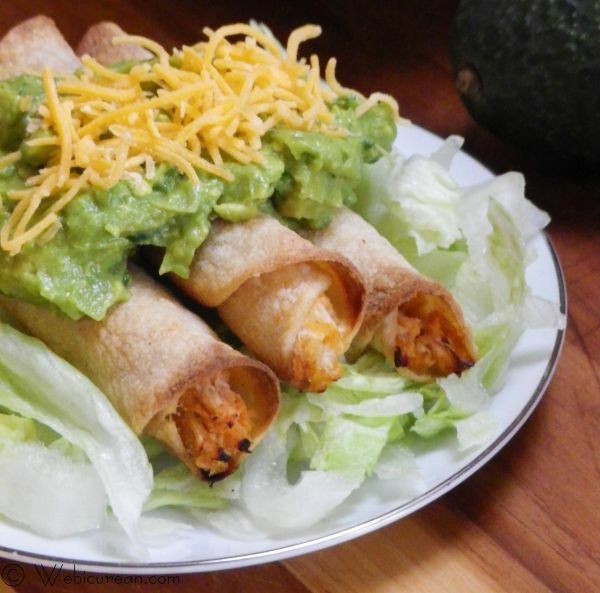 no offense but these are not san diego style rolled tacos…not even close. Are there any special instructions if I want to fry instead of bake these?? Hi Gloria–I’ve never tried frying them. Were you thinking of deep frying? You might want to freeze them first so they hold together better. Beyond that, I’d recommend just following the manufacturer’s instructions on your fryer. Since the insides are already cooked, it’s just a matter of heating them through/crisping them up, so you could probably pan fry as well, if that’s easier. I grew up in San Diego. I have not lived there for 45 years. Whenever I return there, the first place I go to is the taco shop selling rolled tacos, San Diego style. I always gorge myself with at least three orders. I have consumed street food in Bandung, Calcutta, Rawalpindi, Tehran, Kabul, Marrakech, Ghardaia, Stockholm, to Amsterdam and Tokyo, and I will tell you, there is nothing like the San Diego style rolled taco from the taco shop. Oh, this looks so yummy! Great recipe for weekend. My kids will surely love this.